Klosterbrauerei Ettal | Beer Apprentice - Craft Beer News, Reviews, Interviews and Info. Oh yeah y’all!!! It’s time to crack open another brew for today’s craft beer review. For this one I’m going to be trying the Benediktiner Weissbier produced by Klosterbrauerei Ettal / Ettaler Klosterbetriebe GmbH located in Ettal, Germany. This will be my first ever beer from these guys and it’s always fun trying something new, so I’m looking forward to it. I didn’t find much information from the website, klosterbrauerei-ettal.de, therefore let’s just get this thing poured and see what it’s all about. This brew came in a 16.9 oz. bottle and it had an ABV of around 5.0%. It poured a very cloudy, hazy, dark orange color. Some brighter, burnt orange and yellow highlights were shown around the edges and the bottom of the glass. The cap was white, sized well, very soft and sort of rocky. The retention time was more than solid and the lacing looked pretty darn attractive too. The nose definitely had the yeast. It was by far the most dominating aspect. A lot of breadiness, doughy biscuit and a tiny bit of an earthy tone as well. Some clove and only the most faint hint of banana and orange citrus. I liked it. The flavor released more of the yeast, bread and dough. It was semi-sweet with the touches of banana and it also had a slight pear like flavor also. The clove seemed to be more noticeable, however it wasn’t too overpowering. The taste was very “round” and soft. The mouthfeel was medium bodied. Smooth, soft, refreshing and thirst quenching with a medium strength carbonation. A good shot of flavor was left behind on the palate for me to enjoy between sips to boot. Yeah, this was a very nice beer. I like the fact that it’s a bit more “round” and “bready” than some of the other Hefe’s out there that are just overloaded with spices and citrus. Additionally, it’s a very easy drink that would go well with the warmer days of Summer obviously. 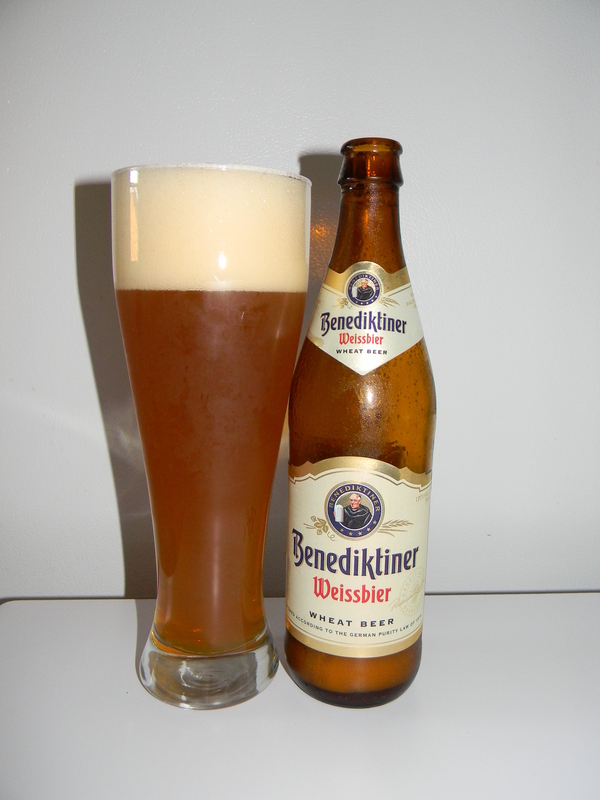 I’d recommend that you guys try the Benediktiner Weissbier before the Summer is over if you have the opportunity. I think you may enjoy it. As always, leave a comment and tell me of your opinion if you’d like.